Hello! 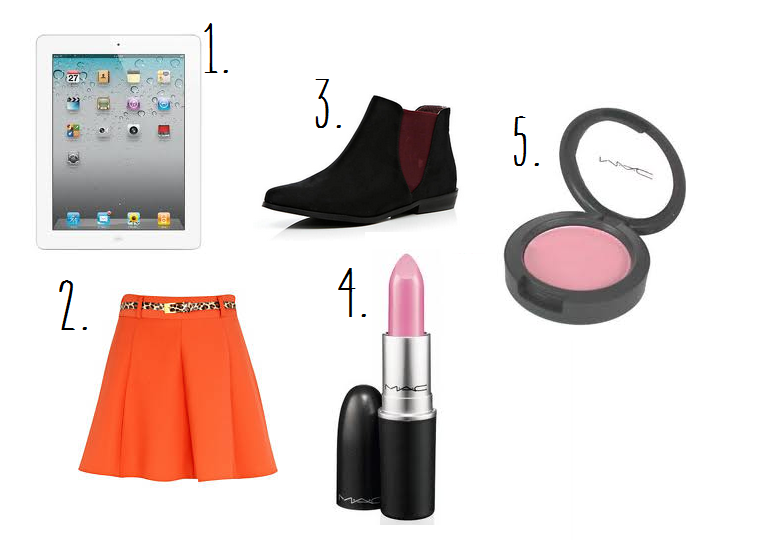 Here are the items I have been lusting after this week! I would really love an Ipad, purely just to look cool. Haha! My uncle found out how much money I have in my "spending" bank account and started trying to persuade me to get an Ipad. It worked. I wanted chelsea boots ages ago but never got them! I much prefer these ones to the leather ones! I have wanted this for ages! I bought a limited edition one called Of Royalty and apparently Saint Germain is similar, so when I run out I will have to buy it! I swear this is the most talked about Mac blush! I have wanted it for ages! What items have you been lusting after? I have been lusting after a couple of leather jackets for fall! I would totally love an Ipad too! I am looking for a new laptop for school though. I think mine is on its last leg. Mac saint germian lipstick is amazing! I have it and i love it. I'm still looking for Chelsea boots too, those ones are gorgeous, especially with the burgundy insert. I missed out last Autumn, now I NEED them for this season! That lipstick colour is pretty! Hi, thanks for sending me your link on the bbloggers chat last night!! These Chelsea boots are gorgeous! I love the touch of colour, makes a difference to the mountains of plain boots out there.